Pakistan is turning a critical juncture in its history said the Prime Minister of India. All Eyes on Pakistan as we speak. Some fear that we might become just a postal address not a state. Just watched a new movie which depicts Pakistan going in Chaos and Taliban taking over our nuclear arsenal. A few years ago ; we used to watch Iraq and Iran in the western media bashing whilst the later still continues. But now Pakistan is becoming the rogue state # 1 gradually as time passes by. Anyways, it’s the truth the country is on cross roads. As I look now with my limited capacity to think; it looks like the status quo would be challenged but would remain the same. How hard I may be able to say this being a big critic of this particular party but looks like that PMLN is getting majority in the next general elections . Though PTI might put up a strong fight the dark horse of PPP and PMLQ due to its electable’s are going to see the light as both PTI and PMLN fight for the same vote bank. Well PMLN is expected to form government in the center as they would be winning Punjab clearly though I feel that PPP would regain strongly in Sind; thanks to the establishment which saw many of its officers becoming millionaire’s under 4 years . Means buying multi million properties in the posh areas of Karachi to start with. The same would ensure that PPP would regain power though unfortunately the poor Sindhi still suffers but not look like awaking in the near future as no clear alternate leadership to lead. Sorry to say the Palijo and Co are nothing but disaster and PMLF is trying to regroup but is agencies decide to stay away. They might have a difficult time to win out of their strongholds like Khairpur District. Second I feel the distrust which exist for a Punjab centered party like PMLN . I feel that surprisingly in KPK; the bulk of the seats of would be won by PTI and ANP is up for an upset as Imran Khan is looking like that Pashtoon Leader badly needed to guide our Pashtoon brothers out of insurgency. With his soft corner towards TTP and JI on his side. With PTI in power in KPK. Imran has a strong chance to calm things down. I would recommend that he focuses on the provincial government though he is hell bent to go for the slot of Prime Minister which I feel is far fetched. If I would be PTI . I would focus on winning the province which would not only give me control on KPK but at the same time some governance experience to put to my credentials. But knowing Imran; his goal would be Prime Minister being the self centric man he is in my opinion; not forgetting the stubbornness he has as no clear strategy for KPK is there. So PMLN would get a good chance to gain power in the center . Though a week government would form as the vote is expected to get divided and many coalition partners would contribute to form the government in the center. I don’t see much change in Karachi and Hyderabad. I wish that Baluchistan is won by Baluch Nationalists for two reasons. Mainly to get them into power since that has been their key demand but as well to show the poor Baluch people ; how sincere these Sardars are to them once they get into power. The Bugti we all cry of was in my eyes nothing but a sadistic and selfish Sardar who could have done much with his own money and taken lead but waited for decades for the government to cough up the coffers though paid millions if not billions of US$ over the years as royalty. In my eyes; his Baluch nationalism woke up once the US$ pipeline got dry and further as the Sui reserves decline; he wanted alternate sources of income which I am sure was not easy to put his hands on. So Baluchistan would definitely hold the key. In my view the main game changer or the vote bank of South Punjab is going to be the decider since for me not one party holds this as of now. PMLN looks weak as they didn’t much here though they boast a lot. PTI trying to wriggle by hoping Shah Mehmood, Javed Hashmi and Jehangir Tareen would together turn the tide. But I feel PPP is up for a fight here. Finally , APML if win one or two seats in these elections would be a miracle mainly as they joined the party too late. So if I put it all together looks like PTI which is the new voice of change might get a dozen or may be more in the next elections and that too because of the electable’s like SMQ and Mr. Kasuri etc. I doubt much would come this year on pure manifesto . Looks like Punjab which holds the key with bulk of the vote bank and seats would vote back PMLN into power with nearly 60-65% of the seats enough to give them the first right to form government . Any seats else where would be bonus. Now I am not saying that PMLN would be a disaster as they would also know that if they fail this time; it’s the end game for them unlike PPP who went on a looting spree and spit on the martyrdom of Shaheed Benazir Bhutto which in the first place got them into power. I just pray to god that the 40 Million voters added to the system would go out and get their voice recognized. The approximate 60% which sit at home would come out and vote and further no threat of TTP and its likes would hold us to the confines of our house out of fear. I feel unfortunately that Pakistan walks a thin line. I could not see any leader uniting the country rather dividing it. I wish who ever comes into Power including PML N would do the politics of maturity and would unite the nation rightfully and sincerely; would govern rather than stabbing in the back type of politics or corrupting the system. As for PTI; they should be ready to be the serious opposition in the next term as PPP is no good but may hold more seats; as they would have no clout to say much due to their past. Now the only thing which may be a game changer would be the silent Pakistanis of the country who would get out and vote. I would recommend that Election Commission instead of holding voting for a day. Should have it for at least 2-3 days inclusive of both National and Provincial Assemblies as per some parts of the world to let people think to come and vote in case they missed Day One. What we want is necessarily not a strong one party rule . But I feel a strong opposition as well. I feel that a diverse coalition is going to be better for Pakistan in case of checks and balances and appeal to all the political parties from North to South. Forget the politics of reconciliation in the name of Pakistan. Because if you mess up one more time the Quaid’s Pakistan which is now left halved would be more under threat. Lead us genuinely and honestly or go take a hike and dear voters. If any one can save Pakistan now is you and only you after Almighty Allah . So go and vote this time to get your voice counted in the name of Pakistan. Pakistan Zindabad! My dear .. in current mode of democracy, elections are bought not fought! Look at the PPP ad … they have been buying the election through government money viz a viz BISP, whilst PML-N did it through Laptops and youth festivals. 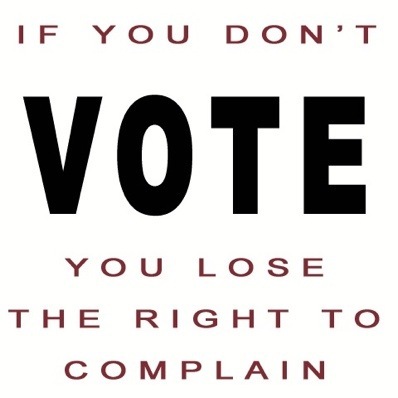 So I disagree that if you dont vote .. you lose the right to complain. A great philosopher one said, democracy is a mediocre system … the best is a Benevolent Dictator!